A genus of low bushy plants, solitary or branched, sometimes forming dense cushions, prostrate or erect, globose or cylindrical, ribbed, with fibrous or tuberous roots. Spines more or less robust, highly variable in size and shape. Flowers diurnal, small to rather large, self sterile, funnel-shaped, often brightly coloured, pink, magenta, red purple, yellow, greenish yellow, brown, sometimes white; stigmas of the pistil mostly green; areoles of the floral tube and the pericarpel bearing spines, bristles and sometimes wool. Some are pollinated by hummingbirds (Archilochus alexandri, Eugenes fulgens, Lampornis clemenciae, Selasphorus platycercus), others by bees (Megachile), rarely by bats (Scobell & Scott 2002, in Emerson 2007). Fruits globose to egg-shaped, longitudinally dehiscent, or indehiscent, juicy, spiny (spines sometimes falling when fruit is ripe). Seeds broadly ovate, tuberculate, rather dull, black. Dispersion performed among others by lizards (saurochory). 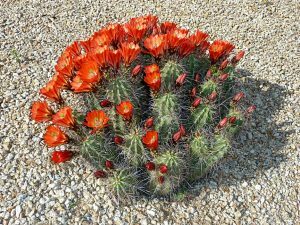 With a wide geographic distribution, the genus Echinocereus grows in very vast and diverse habitats, in the shade or in full sun according to species, in woodlands rich in humus, with pines, oaks, junipers, but also in prairies, mountains where the species living here can withstand frost, deserts, gravelly plains, hills, plateaus, canyons, cliffs and rocky escarpments, arroyos, coastal areas where the plants can receive sea sprays, valleys, dry regions etc., among grasses, bushes or under Mezquites (Prosopis spp. 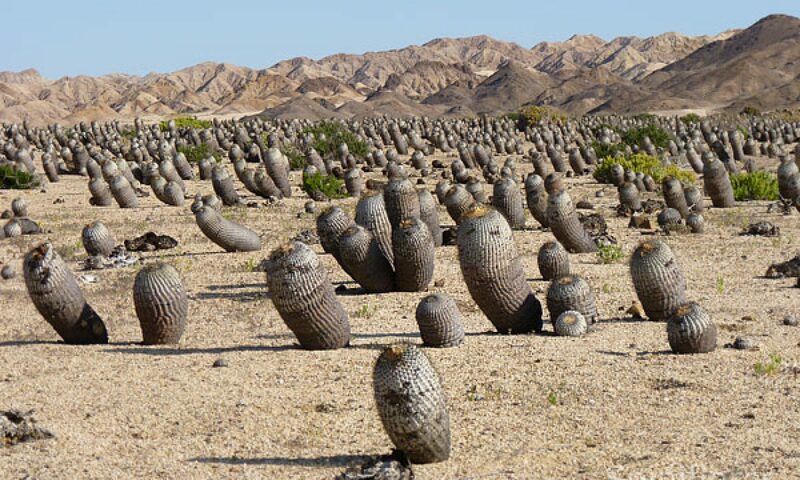 ), rocky outcrops and outwash plains, often on limestone, also on granitic, gravelly, sandy or rocky soils, volcanic tuffs, in the Gulf of Mexico or Pacific coast islands, from sea level up to 2700 m in altitude, together with other cacti and succulents. Mexico (Aguascalientes, Baja California, Chihuahua, Coahuila, Colima, Durango, Guanajuato, Hidalgo, Jalisco, Michoacan, Morelos, Nayarit, Nuevo Leon, Oaxaca, Puebla, Queretaro, San Luis Potosi, Sinaloa, Sonora, Tamaulipas, Zacatecas), USA (Arizona, California, Colorado, Kansas, Nebraska, Nevada, New Mexico, Oklahoma, South Dakota, Texas, Utah, Wyoming).